Joyce DeHaan '67 and her husband, Ed, recently donated money to the Bethel University Inclusive Learning and Development program in honor of Joyce's sister, Mayme. June 15, 2017 | 3 p.m.
Born in a small Montana town when education wasn't offered to children with Down syndrome, Mayme Okken stayed home while her younger siblings attended school. Her academic accomplishments never moved past learning to write her name. 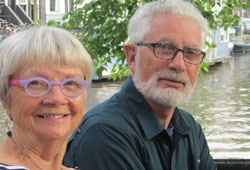 When Mayme's sister, Joyce DeHaan '67, and her husband, Ed, recently learned about the Bethel University Inclusive Learning and Development (BUILD) program—Bethel's new two-year postsecondary program for students with intellectual disabilities—they were inspired. They decided to honor Mayme by creating a scholarship in her name to support BUILD students. "She was a very sweet person who loved Jesus, her family, and all who showed her kindness, but had limited learning opportunities," DeHaan says. "She could've benefited and enjoyed a fuller life if she had education." BUILD began in 2015 and the first class of students graduated in May with an Applied Studies Certificate. "Paying for Bethel can be difficult for BUILD families because many did not think college was possible for their children until recently so they have not had the advantage of saving for college for years and years," explains Dawn Allen, director of the BUILD program. "Now not only is Bethel offering a post-secondary education option for students with intellectual disabilities, but the DeHaans are providing scholarship support to make it financially viable for even more students." The Okken family attended a Converge church in Anaconda, Montana. It was there they learned about Bethel University. "My brother went to Bethel and loved it, so I decided to go, too," says DeHaan. "I came to Bethel and thrived. I grew in my faith and in my knowledge of the world as a bigger place at Bethel. I learned the important role Christians have in the world." The DeHaan's sons, Shane '93 and Luke '97, also graduated from Bethel. "Bethel has been an important part of our lives," DeHaan says. Giving to Bethel has been a significant part of their life as well. "We've been giving to Bethel for years," she explains. "We also set up a trust that will go to Bethel when we pass away." The DeHaan's most recent gift—the Mayme Okken Scholarship Fund—will provide students in the BUILD program the education Mayme never had. "I love the opportunity Bethel gives to such a wide range of people," says DeHaan. "Bethel has a significant impact on our young people, and on the world as they go out into the world. "Giving to Bethel is an important investment that you can't really measure in dollars and cents because it's such a good place. Our dollars there are very well spent."